« Narcopolis by Jeet Thayil. Book review. App.net. Hardly anyone is giving it 182.857%. This isn’t a post about how many, or how few, people are using App.net. It’s a post about how those people that do use it, use it. App.net is a paid for version of Twitter. The idea is that your subscription pays to keep the platform alive and to keep it free from advertising. So, if you’re worried about advertising on Twitter, or if you’re worried that Twitter might not be around forever, or if you have an ethical issue with, say, Twitter’s treatment of the development community, then app.net is theoretically the place for you. It’s pretty much the same as Twitter in every respect. It uses @names and hashtags. And you can repost other people’s stuff. But one notable difference is the character limit for each post. This is famously set at 140 characters on Twitter. On App.net the limit is 256 characters. 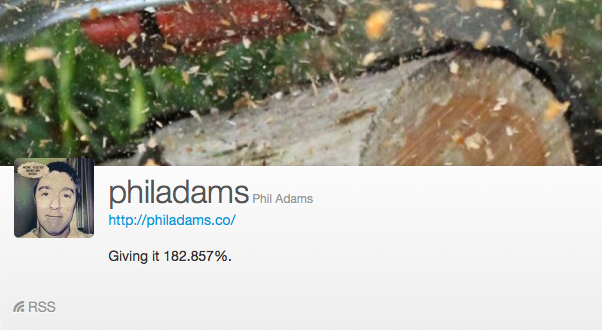 That’s 182.857% of the Twitter limit. Now I’ve barely dipped my toe into App.net. But I’ve already noticed that hardly anyone seems to make constructive use of this extra 83% of potential characters. It reminds me of every time I’ve had a goldfish and bought a bigger tank. The goldfish is conditioned to swim back and forth from one end of its tank to the other. And it clearly develops a strong muscle memory for how far it can swim before it has to turn round and head back the other way. Because when you put that fish in a bigger tank it continues to swim the old tank distance. It turns round and heads back in the other direction when it reaches a distance roughly equivalent to the length of the old tank. It can take several days for the fish to lose its muscle memory and gradually extend the length of each lap until it reaches the far wall of its new environment. My hypothesis was that App.net is so similar to Twitter that its users are acting like goldfish, bringing their 140 character muscle memories with them and taking some time to explore the greater dimensions of their new environment. So in a rare idle moment I ran a small manual test. I looked at 200 posts in the App.net Global Stream to see if there was any kind of pattern to the number of characters used. I ignored posts that had clearly been cross-posted from Twitter or another platform using the likes of IFTTT. I focused solely on primary posts made on App.net, for App.net. I manually counted the characters of 200 posts whilst I was killing time in the Gatwick Airport lounge. I won’t insult your intelligence by quoting an average character number for these posts. But I can report that 163 out of 200 posts were 140 characters or less in length. That’s an almost perfect 80:20 relationship. Perhaps more interesting is the distribution of post lengths. The chart below allocates the 200 posts into 20 character intervals. As it happens, none of the posts came in at exactly 140 characters and so 139 characters is the cut-off point for this chart, above which every post was greater than the maximum length allowed on Twitter. The 80% of posts that fall within Twitter length do a passable impression of a normal distribution. With a long tail of posts taking advantage of up to the extra 116 characters allowed by App.net. Is that proof of goldfish behaviour? I’m not sure. You’d need larger sample sizes and you’d need to track changes in the distribution of post lengths over time to do it properly. I think it does highlight an issue for App.net though. Beyond being a Twitter Plan B, what is it actually for? It has been designed to be (very) similar to Twitter, but it’s so similar that it’s hard to see how it adds any value to a user’s social media presence. It doesn’t obviously do a different job to Twitter. Which is probably why so many App.net streams are populated by automatic cross-posts from other platforms, most notably Twitter. Either that or people are posting on App.net but deliberately keeping the posts below 140 characters to cross post back to Twitter. Either way, the extra effort of creating primary App.net content solely for App.net consumption is not justified for most users most of the time. Unlike Google+, which is really growing on me. Google+ offers sufficiently significant variations in form and function to make it well worth the effort I think. It is definitely a lot more than a Twitter or Facebook Plan B. So I’ve claimed my name on App.net. And I wish the platform well. There is much to admire in its ethos. But, until I’ve worked out for myself what it’s for in a broad social media context, my tongue in cheek App.net bio remains an unfulfilled statement of intent. And I’ll stay swimming back and forth in the smaller of the two tanks for the time being.